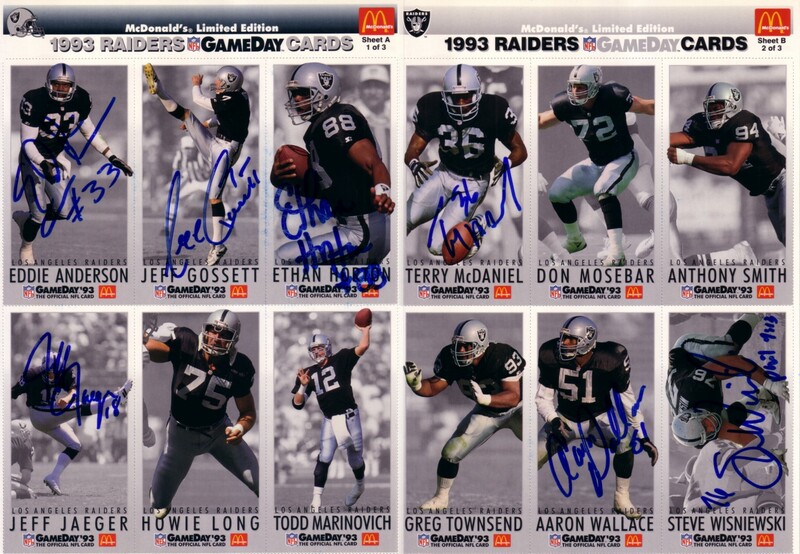 2 1993 Los Angeles Raiders McDonald's GameDay card sheets each featuring 6 cards, autographed in blue marker by 7 of the 12 players: Pro Bowl cornerback Terry McDaniel, Aaron Wallace, Pro Bowl guard Steve Wisniewski, Eddie Anderson, Jeff Gossett, Ethan Horton (signature has minor rubbing) and Jeff Jaeger. 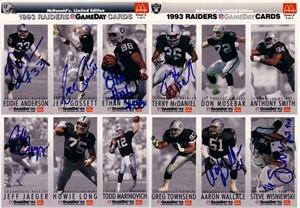 Obtained in person. With certificate of authenticity from AutographsForSale.com. ONLY ONE SET AVAILABLE FOR SALE.